Besides incredible scenery and an abundance of wildlife, the Rocky Mountain National Park area boasts numerous attractions, activities and the natural wonders of mountain lakes, rivers and forests. The Stanley Hotel in Estes Park, registered on the National Register of Historic Places, is a must-see when in the area. Get a ghost tour of the hotel that inspired Stephen King’s book, The Shining. This is the last log hotel still surviving in Grand Lake, Colorado. Here you can experience the historic past of the Rockies. This original Estes Park homestead is still a working ranch and offers self-guided tours of some of the structures required in early days, such as a blacksmith shop and smokehouse. Rocky Mountain National Park contains all sorts of exciting adventures for outdoor lovers, from hiking and horseback riding to fishing and wildlife watching. 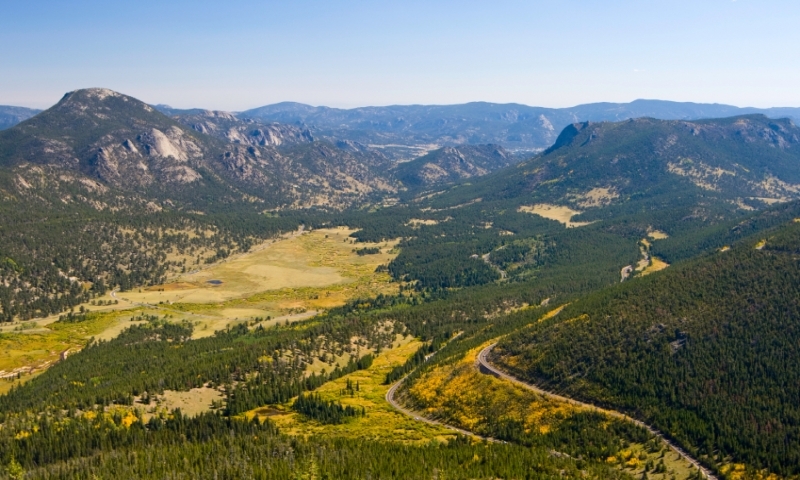 The Arapaho / Roosevelt National Forest stretches around Rocky Mountain National Park and various nearby towns. The trail system allows hiking into the backcountry and the rivers offer whitewater rafting and fishing. Here there are more than 76,000 acres of forestland, situated within the Arapaho and Roosevelt National Forest. View jagged mountain peaks and green valleys. Many like the challenge of hiking to the summit of Longs Peak, although it isn’t an easy task. The climb starts at 9,400 feet and reaches the top at an overwhelming 14,255 feet. This river provides great fishing from May through October and has a healthy population of rainbow and brown trout. This year-round recreation destination is surrounded by Rocky Mountain peaks and is easy to reach from Rocky Mountain National Park. Wonderful for fishing and boating! Discover a paved trail around Lake Estes for a pleasant hike, as well as picnic areas, horseback riding and places to rent bikes for a ride in the shadow of the Rocky Mountains. Besides great fly-fishing, there’s some incredible whitewater rafting and quiet floating available on the Upper Colorado. The Peak to Peak Byway is likely the most beautiful scenic drive in Colorado. It is certainly the oldest. Enjoy the beauty of its pristine lakes and towering peaks. This may be one of the lowest passes over the Continental Divide, but there are gorgeous views and plenty of opportunity to find some wonderful hiking trails. This is the highest continuous roadway in the US, and most of it above 11,000 feet. The Estes Park Aerial Tramway gets you to the top of Prospect Mountain in less than five minutes, but you must spend some time marveling at the views from the summit. The Samson Elk Statue is a larger-than-life bronze sculpture meant to communicate the importance of sharing Earth with the wild creatures of our planet. The Timberlane Farm Museum is located in Loveland. Travel attractions around Moab, Utah.